Happy 200th birthday Redmond Barry! Oooffggh! I’m all “Barry”-ed out after celebrating Redmond Barry’s birthday on Friday 7th June (well, 200 years on) by visiting the exhibitions and attending a symposium to celebrate one of Melbourne’s worthies. First stop, the exhibition at the Supreme Court. This display is a chronological account of Barry’s life and is mounted along the length of a long corridor in the Supreme Court building, with further historical artefacts along adjoining corridors. I entered from William Street, where you need to go through airport style security, but once in you can wander around the corridors quite freely. The display is clear, well-laid out, and probably gave the best overview of his life of the exhibitions I saw. I’d never been inside the Supreme Court building and I’d always assumed that the dome visible from the street covered the courtrooms inside. I was wrong: the domed building is actually the Supreme Court library and what a beautiful building it is. You can go in (despite the gold lettered sign on the door that says that you can’t) and it’s spectacular. Their website has information and a brief history of the library. Redmond Barry was instrumental in establishing the library which was, and still is, funded by the fees that lawyers pay to be admitted to practice in the Supreme Court. The library he established was situated in the old, since-demolished Supreme Court building on the present site of the old City Court (now owned by RMIT)- (the court that Judge Willis was so proud of but never sat in because it opened just after he left the colony). So, too, although Redmond Barry was deeply involved in the design of this library, he didn’t get to see it, because he died before it opened. Next stop the State Library to see their ‘Free, Secular and Democratic’ exhibition, which is on display until 2 February 2014. The library was initially established as the Melbourne Public Library, and unlike many other libraries of the time, there was no vetting process and “every person of respectable appearance is admitted, even though he be coatless…if only his hands are clean”. 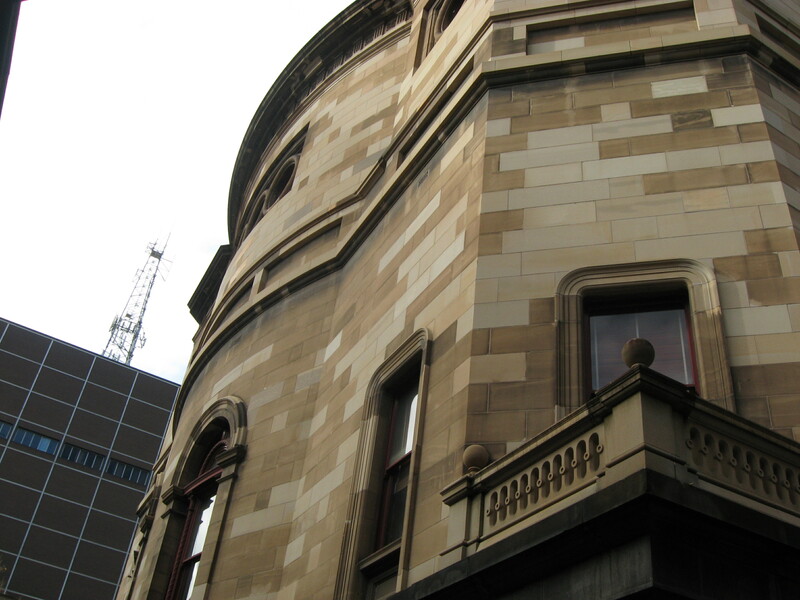 Redmond Barry was the driving force in establishing this library too, which at the time consisted of the Queen’s Reading Room at the Swanston Street frontage, designed in the style of the libraries that Redmond Barry had frequented in Ireland and England before coming to Australia. The display has a heavy emphasis on the architecture of the “The Institution” which eventually came to include the library, the museum, the National Gallery of Victoria. The exhibition explores the idea of ‘display’ more broadly, with a section on Exhibitions as well- a real cultural phenomena of industrialised nations, empire, patriotism and competition. There’s a good slideshow on the SLV site. There were four speakers at the symposium, each exploring a different facet of Redmond Barry. Stuart McIntyre, Ernest Scott Professor of History, University of Melbourne started with an exploration of Redmond Barry as the inaugural university chancellor. He portrayed him as a hands-on administrator, with a strong ceremonial presence. He made the study of the classics compulsory for all student, which was rather old-fashioned at the time, but as the basis of a broader curriculum in the professions like law and medicine. He battled with the professors and with the university senate, and insisted that the professors not comment on religion, and later politics, for fear of sectarianism. John Waugh Honorary Senior Fellow, Melbourne Law School spoke of Redmond Barry’s contribution to legal education. In England (and in many other places throughout the empire) at the time, a legal education was part of being a gentleman, but it was not professional training as we know it. Lawyers would undertake an apprenticeship with other lawyers and undertake self study. 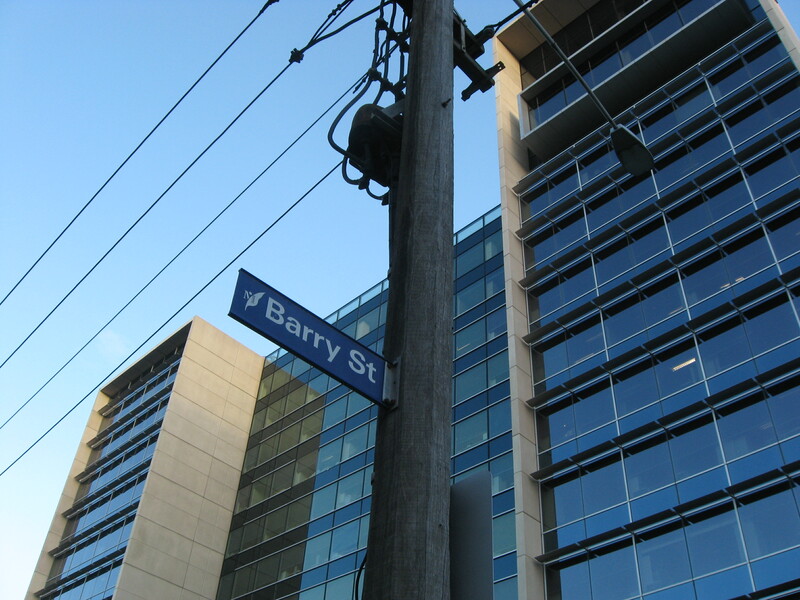 Barry derided the practical, technical nature of this system, although he was later to exhort law students to simplicity and logic in their arguments- something rather at odds with his own love of rhetoric. 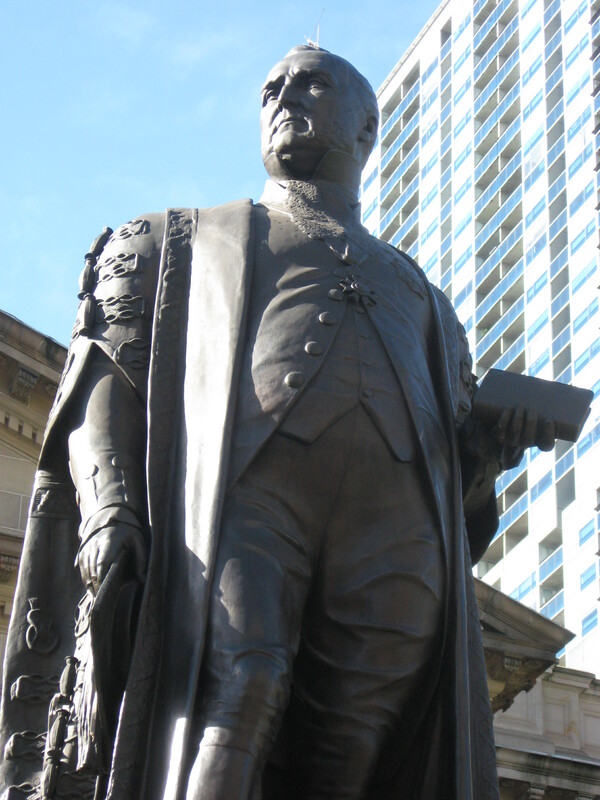 In 1857, in his dual role as chancellor and sitting first puisne judge, he ensured that law students from the University of Melbourne were exempt from sitting the examinations of the Board of Examiners. In 1872 university education was made compulsory for barristers, thus in effect delegating entry to the profession to the universities: a very unusual practice that was found only in South Australia. The Chief Justice, Marilyn Warren spoke about Barry as a Judge. She noted that Barry’s reputation as a harsh, conservative judge is dominated by the Ned Kelly trial. She described him as a detached, black letter lawyer, who was a judge of his times. She suggested that in the Ned Kelly trial, he saw Kelly as symptomatic of an ignorant, ungovernable youth culture that needed to be stamped out. In other cases, e.g. the Eureka case, he was more liberal. She noted that contrary to popular belief, he was only ever first puisne judge and never Chief Justice. He had good reason to believe that he would be appointed to replace William a’Beckett when he retired, but he was overlooked. She suggested that this was because he aggravated people; the government could not be quite sure of how he would act in the position, and because his long-term liaison with Mrs Barrow was a matter of scandal. Finally, Sue Reynolds, Senior Lecturer in IT and Logistics at RMIT spoke of Redmond Barry’s contribution to the four main libraries that he has been associated with: the Supreme Court library, what is now the State Library of Victoria, the Parliamentary Library, and the library at the University of Melbourne. She has written a book about the early years of the Supreme Court library called Books for the Profession. Barry was a prominent member of the board for each of these four libraries, and very much involved in the sourcing and purchasing of books and production of catalogues. Being so involved in each of them, he was able to guide the development of their collections to reflect the unique purpose of each one and its relationship with the others. And so, talks presented and cakes eaten, it was time to head home. On the way out of the Baillieu library, I stopped to look at their display which was drawn from their own archives and which reflected Barry’s wide range of interests. Time for one more- the small display in the Law School library situated- how appropriately, on the corners of Barry and Pelham Streets in Carlton. Ye Gods! What is this excessively palatial university building??? (Not from the outside- go inside to the foyer.) I’d seen the beautiful Supreme Court library that day, and I’ve been into Queen’s Hall at SLV and they too are lavish buildings in their pompous, 19th century way, but this one just seemed too slick, too “look at us-we’re world class”, too corporate- especially compared with the often overcrowded and primitive accommodation given to other faculties. Needless to say, when I arrived home and saw the three ‘begging’ letters from the University of Melbourne addressed to the three Melbourne Uni alumni who reside at this house, they went straight into the bin. I wonder what Redmond Barry would make of the building? I really don’t know. Anyway, happy birthday Sir Redmond. This entry was posted in Melbourne history, Port Phillip history, Things I've seen recently, What I've been listening to. Bookmark the permalink. I’ve been away from your blog too long so I’m sitting down for a feast of the Resident Judge! What a wonderful day you had. I had heard about the symposium but sadly couldn’t manage to line up a trip to Melbourne for that day. Lisa and I had an enjoyable time wandering through the ‘Free, Secular and Democratic’ exhibition at the State Library on the weekend – sorry to have missed you. I’m in the midst of writing up a review of the exhibition. I’m glad that it is going to be open until next year as I wouldn’t mind paying another visit. Thanks for this post. It has reminded me that I must visit the Supreme Court Library.